City Holiday In Nepal,City Tours|sightseeing Tour In Nepal. Up on arrival at the International airport in the Kathmandu you will be picked up by our airport representative and transfer to the hotel. After check you will have free afternoon to explore the area by yourself (if you need any assistance from us please let us know). Later in the after you will meet one of our office representative for briefing about your tours, at that time if you have any question or and queries could ask with us and then walk to one of the Authentic Restaurant for welcome dinner. Stay overnight in Kathmandu. Today you have a full day guided sightseeing tour to the Buddhist and Hindu sights in Kathmandu, probably to Durbar Square, then visit “Swyambhunath” a Holy sight of Hinduism and Buddhism also known as “the monkey temple” as a large number of holy monkeys are living in the north-west part of the temple. Next, you will be taken to “Pashupatinath a sacred Hindu temple situated on the bank of the Bagmati River. You will then be driven to “Boddhanath Stupa” one of the biggest and oldest stupas in the world. Second overnight in Kathmandu. This is another good destination for internal and external tourism. This is natural beauty city, from where you can see nice view of the Annapurna, Dhaulagiri and Manaslu Himalayan range include Fish-tail Mountain. It has such a nice natural lake which is located on the hearth of city. Today after breakfast, we have scenic countryside drive to Lakeside city of Pokhara. Stay overnight at the hotel. After breakfast explore Pokhar City; visit museum, waterfall, cave and boating in the lake. Stay overnight in Pokhara. We wish you have a wonderful time with us! Guided sightseeing tours in Kathmandu and in Pokhara with privet vehicle. Kathmandu Valley Sightseeing Tour – Historical And Cultural Sites. Day 01 :Arrival at Kathmandu. Day 02 :Full day city tour Kathmandu. 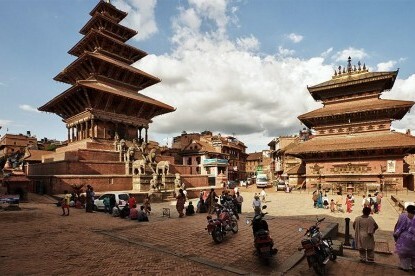 Day 03 :Full day city tour in Bhaktapur and Patan. Note: The above information is a guide and standard template of what we provide. All our trips can be customized at your request to accommodate your specific requirements. Pickup and drop from and to airport by private vehicle. Hotel in Kathmandu on BB plan. Guided City tour in Kathmandu by private Non-A/C vehicle. Government license holder English speaking local tour guide. Nepal entry visa, you can obtain a visa easily upon your arrival at Tribhuwan International Airport in Kathmandu. All others expenses which are not mentioned on Price Includes section.